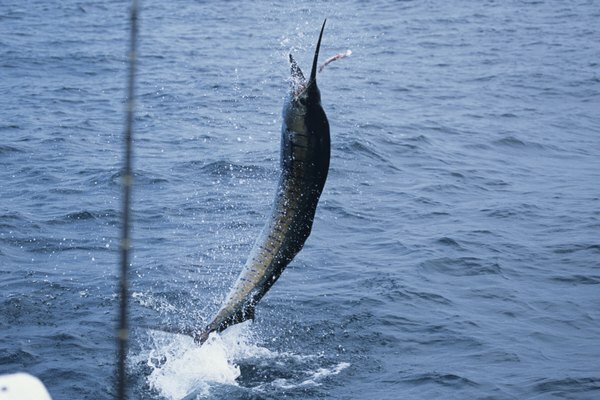 What Is the Difference Between a Sailfish & a Swordfish? 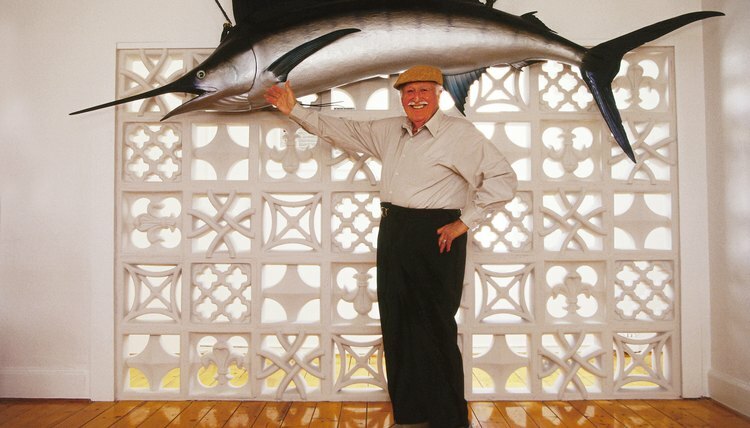 The Istiophoridae and Xiphiidae families encompass the 12 species of billfish including swordfish and sailfish, commonly referred to as the billfish family. Billfish are large marine fish that are important apex predators in their environments. They are found in tropical and temperate waters throughout the world’s oceans. They generally live far from shore in the open ocean at the surface and in deep water. They are prized by fishermen due to their large size, difficulty to land, aggressive resistance and spectacular leaps from the water when caught on a hook. Swordfish (Xiphias gladius) are the only member of the Xiphiidae family and are found throughout the world in tropical or temperate waters. They are pelagic, living in the open ocean, near the water surface or in deep water but never at the bottom or in coastal areas. They are able to survive in water temperatures as low as 50 degrees F. Swordfish can reach sizes of up to 1200 pounds and 15 feet in length. They live for up to nine years and reach sexual maturity between two and three years of age. The swordfish’s top jaw forms a long, sharp edged, relatively flat appendage measuring at least a third of its body length that resembles a sword. It has a distinguishing first dorsal fin that is long, thin and shaped like a crescent. The tail also forms a crescent. Adult swordfish do not have teeth or scales. The scales they have as juveniles turn into skin as they age. Their color ranges from brown to blue-gray. Swordfish are mostly loners. They are rarely found in schools and swim in loose formations far apart when with other swordfish. Swordfish are primarily night feeders often using their bills to stun and feed on smaller fish such as mackerel, herring and bluefish. When they can find it, they prefer to eat squid. Adults have only three real natural enemies: sperm whales, killer whales and large sharks. Sailfish (Istiophorus albicans) are smaller than swordfish, reaching lengths of up to 10 feet and 220 pounds. Like the swordfish, they are found through the world’s warm and temperate oceans. They are also pelagic and are found mostly near the surface or deeper open ocean. They reach sexual maturity between one and two years and have shorter life spans than swordfish, living up to 4 years. The sailfish’s top jaw also forms a bill or sword. Its name comes from a dorsal fin that runs almost the length of the body and, when extended, is significantly higher than the width of the body. Their tails look more like a letter V than a crescent. Their color ranges from brown to shades of blue. Sailfish have both teeth and scales. Sailfish are generally loners like the swordfish. They feed on smaller fish like sardines and anchovies and also prefer squid and octopus when available. They feed far from shore and are generally surface feeders. They are the fastest fish in the ocean, much faster than swordfish, and have been clocked at more than 68 miles per hour. They use their speed to help them catch prey. Adult sailfish have the same natural enemies as the swordfish.